Maintaining a clean and sanitized office is crucial to the health of workers. However, an office that is cleaned every day with dangerous products that are full of toxic, unsafe chemicals is not truly clean, is it? It’s not. In fact, 1 out of every 3 chemical cleaning products contains ingredients known to cause human health or environmental problems. 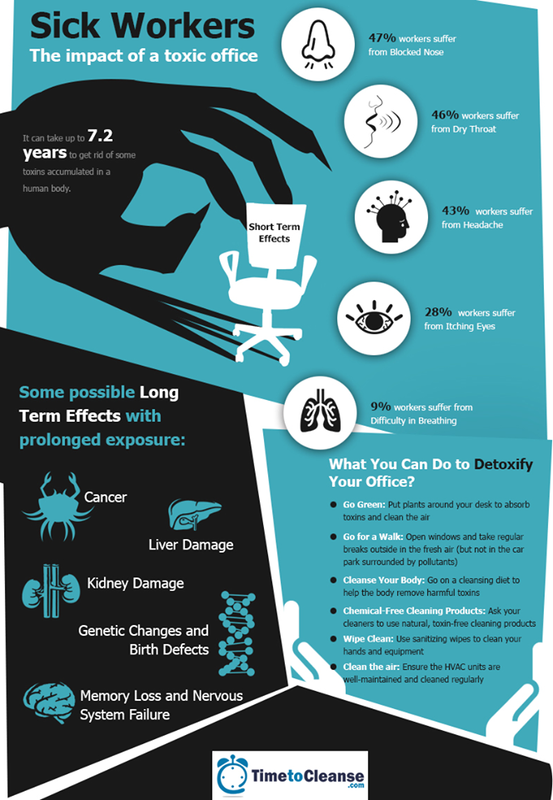 Below is an infograph about what you can do to “detox” your office and keep workers from getting sick (and also ensure that everyone has better longterm health, too!). As always, make sure the products and solutions being used to clean your workplace are chemical-free and certified green! Feel free to visit our website for more information about the benefits of green cleaning.